Waterproofing asphalt and polymers A method of waterproofing where are associated diferent materials such as asphalt and polymer. Its application is made "in situ" by a advanced technology machine, projecting spray switch next to the agent to maintain a constant pressure and flow. 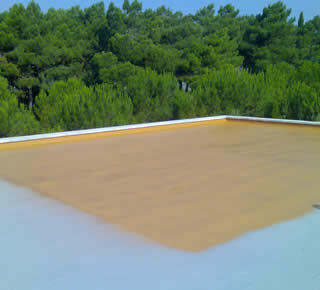 APPLICATIONS: Particularly suitable for waterproofing large areas: terraces, decks, etc..
Do you want information about Waterproofing of terraces?